Submitted by plantrocks on Fri, 11/13/2009 - 20:39. I imagine there is a pretty straightfoward explanation: income, education, and race are all correlated. Instead of having race as the metric, we could substitute income levels and have a completely different conversation. I think the way the article is presented is horribly misleading and, frankly, irresponsible. It makes it a lot easier to be progressive when you don't have to worry about putting food on the table or keeping your kids safe, whatever your race. Submitted by THeller on Wed, 11/11/2009 - 07:22. The lesson-in-a-nutshell to be learned from Aaron's piece is that demographics is key to an urban area's destiny and character. Portland is a prime example -- sheesh, its 'progressivism' is gonna be worse than I experienced (and fled) in 27 years in Seattle. For those interested in learning more on demographic 'herding' behavior', see Thomas Schelling's "Micromotives and Macrobehavior" chapter 'Sorting and Mixing', especially the 'A Self-Forming Neighborhood Model' section. He presents a nice intuitive spatial model using coins. Submitted by roamer1999 on Tue, 11/10/2009 - 20:22. We should be careful about making broad sweeping assertions as in "progressives" do this and "conservatives" do that and then deploying those labels to explain behavior or even worse, motivation. Yet, the article poses interesting questions - why is it that so called urban "progressives" are often highly concerned about amenities such as dog parks, coffee houses, hip restaurants and art house cinemas. How about fellow citizens, who may be different, by race, class, wealth, ethnicity or any of myriad classifications? Well, not so much. The simple, but complex answer is that, as a nation, as a world for that matter, we're all a part of the same hypocrisy (to paraphrase Michael Corleone of "The Godfather" film), progressives included. Contradictions and illogic abound, that's what makes us human. I live near Boston, certainly by any measure a "progressive" city and in the bluest of the blue states to boot. It's a highly walkable city, with great public transportation. However, the once dilapidated downtown area is rapidly becoming a series of gated communities rising into the sky. Just as sheltered, just as isolated as the much decried suburban McMansion communities. Now here’s what’s interesting - these new city-dwellers are actually working to create a "Disneyland" version of urban living! Wonder what explanations Malcolm Gladwell or the folks over at Freakomics would offer..? Submitted by anon3 on Mon, 11/09/2009 - 18:34. I know it's been a fad for awhile for white apologists to write articles in which they presume to know what black people want ("...not to be racist or anything") but if lack of appropriate minority percentages in a city is a "problem" that prevents it from being accurately touted as "progressive" - what is the solution? Do you think minorities (black folks in particular, to fit with the author) should be loaded into a cattle car and shipped to certain cities in order to beef up selective statistics? Did he do any research into the importance of family within the black community, or other priorities of minority populations that make living in the Pacific Northwest impractical - or is it just assumed that the only reason for a predominantly white population is because minorities have been unofficially banished? Cities like Atlanta prove that predominantly black cities can be just as progressive, thriving, and economically booming as the so-called white cities mentioned in the article. As much as the author would like to further the opinion that minority communities need to be "saved," we're perfectly capable of saving ourselves. Submitted by CU_rak on Thu, 11/05/2009 - 18:08. Though the statistical analysis is a bit messy (it always is when comparing today's sprawling, multi-jurisdictional cities), I applaud the author's initiative in adressing the racial divide between cities seen as "progressive" and the older, post-industrial cities that are percieved as being behind the curve. I think the big issue here is the presence of large black populations who have been hit by the twin 20th century hardships of disappearing manufacturing jobs and persistent racism. This results in concentrations of poor blacks in large areas of these cities and becomes a drag on places trying to bring back middle and upper class people, mostly whites, who want to live in a safe and comfortable URBAN environment. 1. The difficulty in growing and enhancing a city with a large and concentrated population of poor black people lies in both breaking the cycle of poverty and changing perceptions that in urban areas, race=class. Kids who grow up in areas of concentrated poverty face an enormous uphill climb and the odds are severely stacked against them. Sure, there are some who can overcome the odds, but let's not delude ourselves into thinking that urban poverty can be curtailed simply by people "pulling themselves up by their own bootstraps". Secondly, we need to abandon the idea that racism is dead, and accept that there are still divisions within our society that need to be rectified. Seeing a bunch of black people on the street and saying aloud "this area is pretty ghetto" or "better roll up the windows" may not seem to be harming anyone, but it reinforces an invisible barrier between human beings and defines an entire race as both inferior and dangerous. As long as these ideas persist, upper class whites will largely avoid cities with large black populations. 2. There will always be poor areas, but the best option we have for advancing our cities is to break the cycle of poverty for younger generations. Investing heavily in schools and providing avenues for job training and paths to entry-level, middle class jobs is how this poverty can be alleviated, but it is neither cheap nor easy. We as a nation still have not reversed the damage that slavery, segregation, redlining, and racial hatred have had on our black populations. That is the legacy that burdens the so-called "non-progressive" cities. Just because the "progressive" cities do not have as big a problem with urban poverty does not mean that they are a model for the future. They simply have a cleaner slate to start with. As for the people who flock to Portland out of frustration with Cleveland, it is understandable, even justifiable to seek out a more comfortable place to live, but it is also selfish and anti-social to run away from problems rather than working to fix them. Perhaps we should have abandoned lower Manhattan after 9/11 or let New Orleans die after Katrina? What is needed is a national commitment to rebuild urban education and job training, so that we can finally reverse a problem that we as a society created in the first place. Submitted by galang on Sat, 10/31/2009 - 15:31.
this article articulated ideas that i have been mulling over for a while , having grown up in austin and now living in seattle. what really bothers me about these cities is their relentless self-identification as progressive bastions when the kind of progressivism they offer actually seems to really lack any kind of racial justice lens. the dominant culture of these cities seems to me to basically be a white liberal one that at its best pays lip service to the issue of racism and never really ever challenges racism on economic, social, or cultural fronts. i dont think that the racism in these "progressive" cities is necessarily more insidious than it is in other cities of similar size, but it certainly feels more hypocritical. 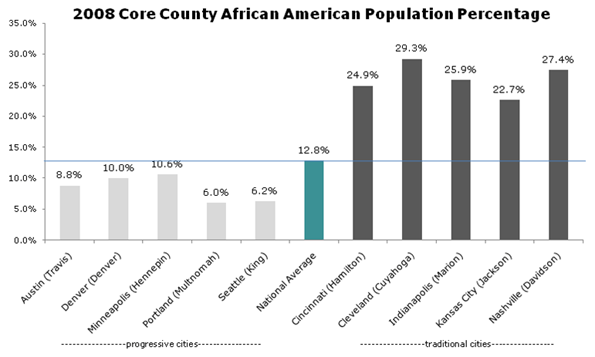 also, the actual lower population size of people of color in these cities makes it so that this dominant culture can kind of stifle any challenge to its self-image. that said, i have found in each of these places communities of color that actively assert their own progressive perspective and contest the white liberal one. cant say how these communities compare to similar ones in cities thought of as "less progressive" however. i have the feeling that they are not that different, that whether its a "liberal" city or not, they are fighting against the racism and economic and other inequalities that exist in our society everywhere. A better title might be "The White County"
Submitted by Kurosawa on Fri, 10/30/2009 - 12:36. 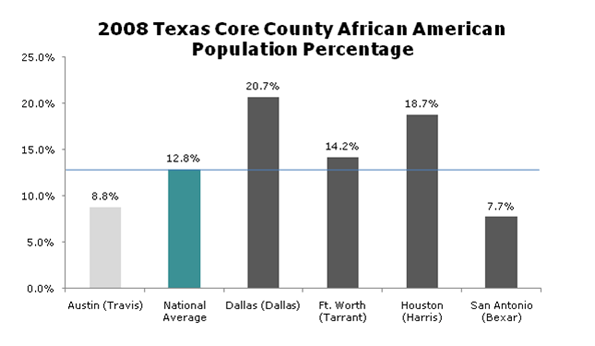 Using county demographics tends to understate the actual diversity of the cities in question. Thinking about diversity only in terms of black and white is also not very diverse, it seems to me. Seattle, for instance, is about 68 percent white, or 32 percent non-white. That doesn't mean that there is not a color-line in Seattle - south Seattle is predominantly non-white, while north Seattle is predominantly white (although increasingly Asian). There are convergence zones, however - Capitol Hill is the most diverse community in Seattle and also the most dense. 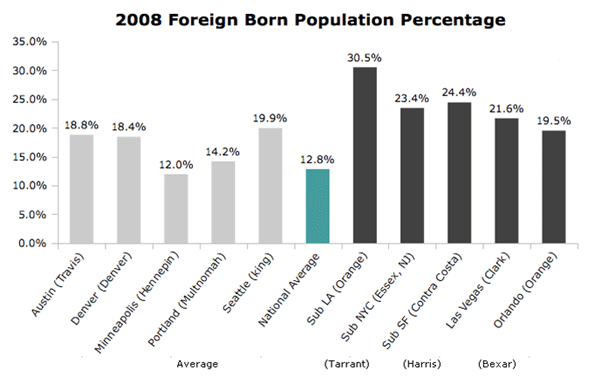 West coast cities also tend to have larger Asian populations and smaller black populations for largely historical reasons. Asian migration to the west coast dates back to the 19th century, while much of the black migration occurred beginning with WWII to work in wartime industries (ships, planes, etc). Black migration to the rust bucket began much earlier. That said, transit-oriented development policies and urban growth boundaries can have the effect of driving minorities out of their traditional central urban neighborhoods, which are rapidly becoming gentrified (reverse white flight, I suppose). In Seattle, that increasingly means that the non-professional working class and the working poor, more likely to be non-white than not, is increasingly being driven to the urban fringe (Renton, Federal Way, White Center, etc. ), where they have much poorer access to transit, social services, medical facilities, etc. Submitted by cecil91 on Thu, 10/29/2009 - 08:00. One issue the article failed to consider is the crime rate. Atlanta, residents endure three times the rate of violent crime that residents of the next largest city, Columbus, have to put up with. So how is this added into the mix that labels Atlanta some sort of New South Mecca? Ooops, I forgot, mentioning crime rates of cities with large minority populations is PC verboten. 'Scuuuse me! Submitted by VenturaHighway on Wed, 10/28/2009 - 13:41. The cities mentioned as progressive white enclaves have one thing in common that makes them so attractive, and that is their embrace of the "creative class". They welcome different points of view and have a generally live and let live attitude. It's literally a more positive energy. It's not a diversity quota that you'd expect from the Post Office. If young educated people are moving to Austin or Portland, it's not because they don't want ethnic diversity, they are searching for creative diversity. By the way, that includes the exceptance of gays, who are a very distict minority group in their own right. I'm gay, and I live in Denver, and this city is very welcoming. By the way, Denver is only 50% white, and I DO like the ethnic diversity (large Latino population too). But to say that the black community is the "big kahuna" of diversity is not true. A black neighborhood is no more diverse than a white neighborhood. I wouldn't want to live in Salt Lake or Boise either, which are very white, but very conservative. 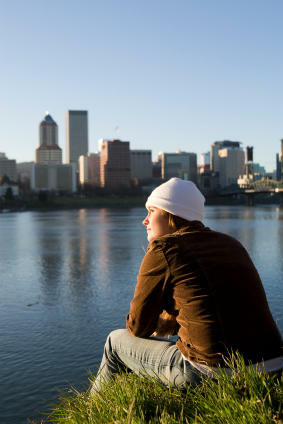 Some of the progressive cities mentioned in the article simply have a more welcoming and forward-thinking personality. Submitted by CLC on Wed, 10/28/2009 - 08:21. It seems you are getting quite a bit of flack about your stats...stats aside as a 'minority' resident of Austin for 6 years I can say that amongst my nearest and dearest I refer to places such as Austin as white people heaven. Portland and Seattle as well. Bus systems are for us poor minority folks while the high-falutin 'New Urbanist' ideas like walkable communities and transit are for white folks...or for us minority tokens that have made good, pulled ourselves up Horatio Alger style, got some education and some 'manners'- you know 'whitened up.' Be honest Austin, Portland, Seattle, etc. You know you don't have mass populations of poor minorities crowding you out in at your walkable coffee joint or teeming into your neighborhoods...or *gasp* attending school with your young, urbane, hipster children!